You have the oldest furnace still in existence — or perhaps just a solid clunker? If so, you could win a brand new furnace for free or several other valuable prizes from A/C Contractors. Why? Images of hilariously old furnaces go viral for us on social media, so we want to gather as many as we can and reward the best and oldest ones. If you think your old clunker of a furnace is the one, take a photo of it and send it to us, along with another image of the manufacturer’s name and a serial number. Or you just write these down and send them with the main photo. 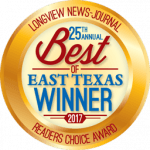 If you win the contest we will remove that old furnace and replace it with a brand new, high-efficiency furnace worth up to $5,000! Gets 25% off the cost of a replacement furnace! Any entrant with a furnace over 10 years old gets a free Super Tune-up (Value: $189). If you’ve made it 10 years, you’re already doing well. If your image is great, and your system is more than 10 years old we’ll help you get more life out of it with our Super Tune-Up. Many accidents involving gas furnaces are caused by faulty parts. And, older furnaces that don’t comply with current standard safety codes are at an even higher risk. 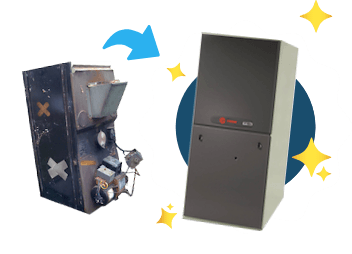 The average life expectancy of a gas furnace is 10 years depending on the brand and maintenance performed over the life of the unit. As mechanical equipment ages, its performance degrades and becomes less efficient. Contest begins November 1st, 2018 and ends December 6, 2018, at 5:00 pm. Entries must be received by November 30, 2018, by 5:00 pm. The winner will be selected on or before December 15, 2018, and informed prior to any media announcements. The best way to enter is HERE. Drop off photos and serial numbers at the A/C Contractors office located 3830 Gilmer Rd, Longview, TX 75604. Entries may also be mailed to the same address above but must be received by November 30, 2018, at 5:00 pm regardless of the mailing date. The contest is for owner-occupied, single-family homes with central, ducted furnace systems. Entrants must be homeowners at least 18 years of age and fully empowered to make the purchase and home improvement decisions regarding their residence. Where You Should Be Located? Homes must be located in A/C Contractors’ service area defined by Gregg, Smith, Harrison, Marion, Cass, Upshur, Camp, Morris, Titus and Wood counties in Texas. The current heating system must be operating and providing some heat to the home. The contest applies to standard central heating systems fuels by gas, propane or electricity. Any other types of equipment or installations are NOT included. The duct system must be in good condition and properly sized for the furnace and must be free of mold. To qualify, representatives from A/C Contractors must be allowed access to the furnace to examine the installation and verify the manufacturer’s nameplate information (model and serial numbers and dates). A/C Contractors will make 2 attempts to contact the homeowner to arrange a verification appointment. A missed appointment will be rescheduled at the discretion of A/C contractors and subject to disqualification. The Oldest Working Furnace Contest is not a game of chance. 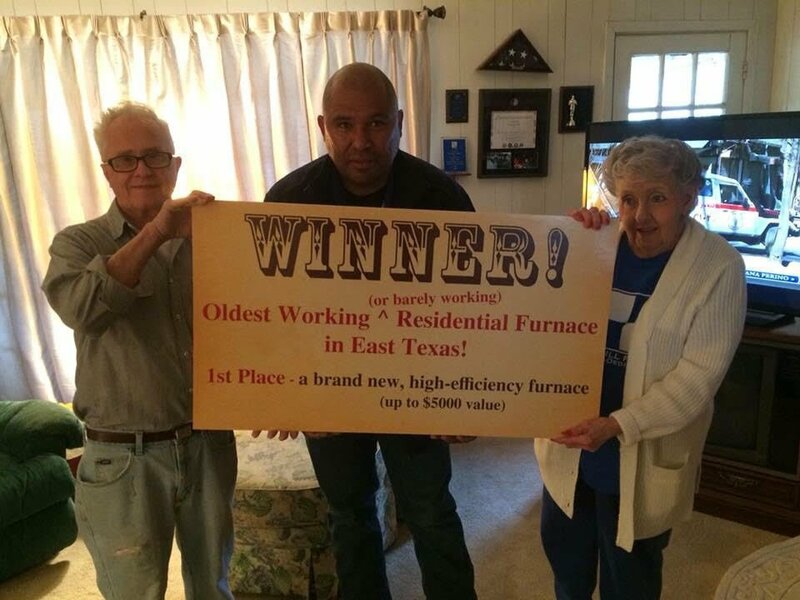 The winner will be the oldest furnace submitted according to the objective information such as model and serial numbers, installation or sale paperwork provided by the homeowner and/or the best judgment of A/C Contractors employees. In the event of a tie, the earliest entrant shall be the winner. All decisions are final. The winning entry will receive a new high-efficiency furnace up to 5 tons, as well as complete normal installation up to $5000 in value. Any upgrades or additional needs are not included. The winning entrant will be responsible for: taxes, permits, duct system modifications (if necessary), any hazardous material removal and abatement (e.g. asbestos) and any improvements needed to bring the installation to comply with existing building and mechanical codes (any applicable costs will be discussed beforehand). The new system must be installed in the same home in which the winning system was installed. The winner will be posted online at www.accontractors.com and our Facebook page before or on December 15, 2018. The winning entry will agree to allow A/C Contractors to use images and likenesses of the old and new furnaces as well as homeowner’s image and homeowners’ name in the promotional material. Entrants may receive newsletters and other information from A/C Contractors from time to time. Note – your info will not be shared with other companies. You may remove yourself from any subscription list at any time by following the “unsubscribe” directions in any email we send you. Entrants agree to hold A/C Contractors, its owners, sponsors and employees harmless for any injuries, loss or damages related to the contest. All prizes in the Oldest Working Furnace Contest are non-transferable and may not be redeemed for cash. Winner of the Oldest Working AC Contest must reply within ten (10) days of notification either via email or by calling the phone number provided upon prize notification, or else an alternate winner will be selected. No entry fee or purchase is required to enter. Employees of A/C Contractors and their family members are excluded from entry. Please fill out the form below and make sure you’ve read the details and rules! I have read and agree to the contest rules and details. By submitting this form, you give A/C Contractors permission to provide you with updates about this contest, exclusive A/C contractors and subject to disqualification. discounts and helpful information via email. Don’t worry we won’t sell or share your information and you can opt out at any time.